The coastal town of Chennai is a bustling metropolis that has managed to hold on to its roots in spite of rapid urbanization. 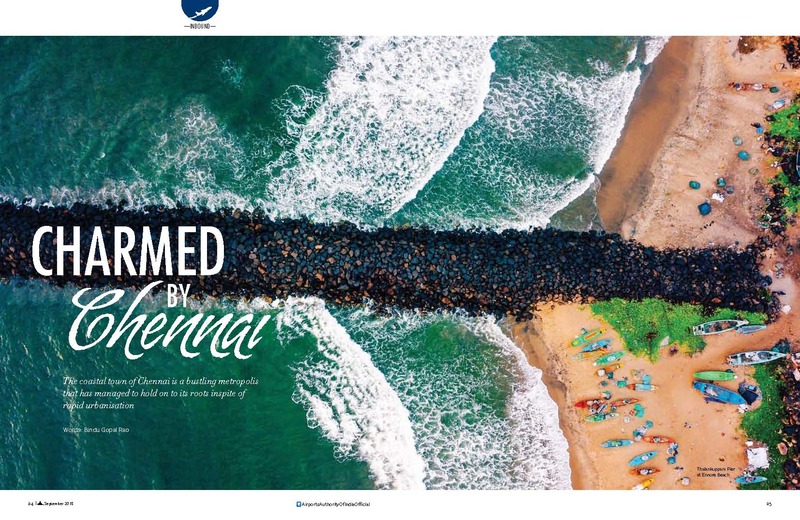 Located along the Bay of Bengal, Chennai has a cultural ethos that seamlessly blends with the contemporary giving the city a character that is as unique as it is vibrant. With beaches, museums, temples and churches, history and heritage can be seen from all corners. 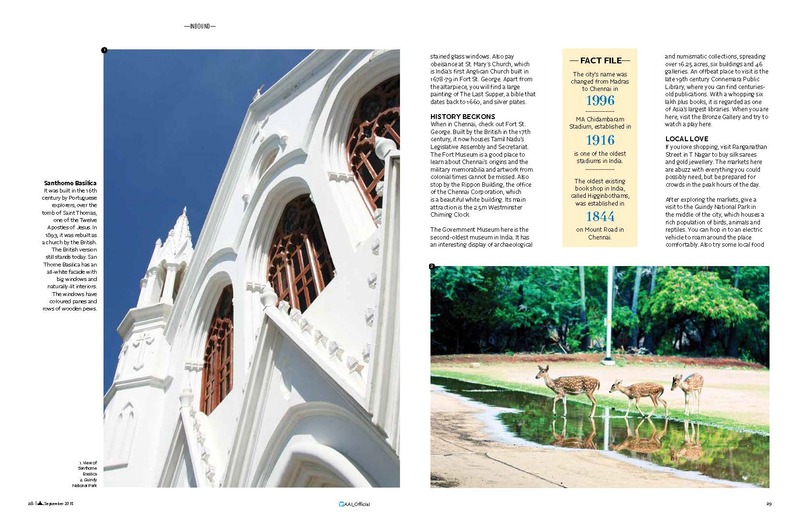 Here are some things that must be on your ‘to-do’ itinerary on your next trip to Chennai. Start your day early by visiting the Marina beach that has a 13km long coastline and is in the midst of the city. This is where the city folks chill, so as the day progresses the crowds swell here so the best time to see the place is the morning. You can visit the light house here as well as the MGR and Anna memorials apart from a host of statues. For a quieter beach experience, head to the Elliot beach at Besant Nagar which is close to the Velankani church and Ashtalakshmi temple. If you like the water and like to travel for it the Covelong or Kovalam beach located 40 km away is a good idea as is the Thiruvanmyur beach located in the Thiruvanmyur locality. 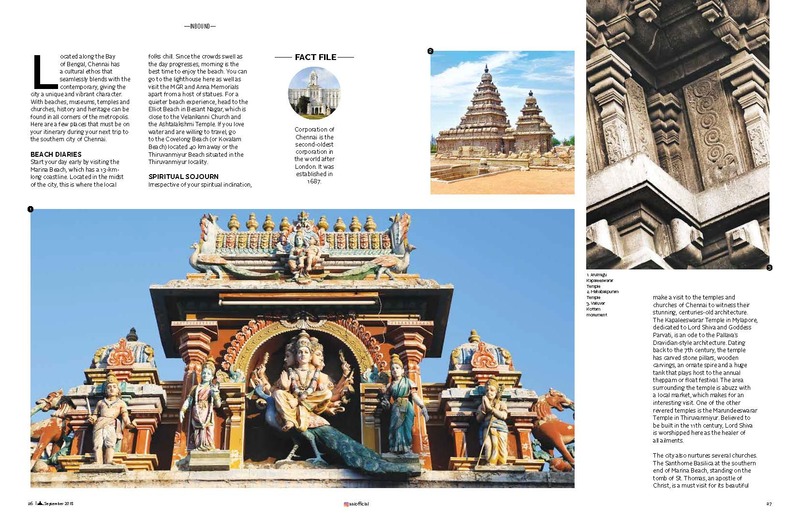 Whether you are spiritually inclined or not, a visit to the temples and churches in Chennai is recommended because many of them date back to many hundreds of years ago and their stunning architecture are worth marveling at. The Kapaleeshwar temple in Mylapore dedicated to Lord Shiva and Goddesses Paravati dates back to the 7th century and is an ode to the Pallava’s Dravidian style of architecture. The temple has carved stone pillars, wooden carvings, an ornate spire and a huge tank that plays host to the annual theppam or float festival is held. The area surrounding the temple is abuzz with a local market that makes for an interesting visit too. One of the other revered temples is at Thiruvanmiyu at the Marundheeswarar temple said to have been built in 11th century. Lord Shiva is worshipped as the healer of all ailments here. There are also several churches in the city and the Santhome Basilica at the southern end of Marina Beach raised on the tomb of St. Thomas an apostle of Christ is a must visit for its beautiful stained glass window at the basilica. Also pay obeisance at St. Mary’s Church which is India’s first Anglican Church built in 1678-79 in Fort St. George. Apart from the altarpiece, a large painting of The Last Supper, a bible that dates back to 1660 and silver plates are a must see here. When in Chennai, check out the Fort George, built by British in the 17th century and now houses Tamil Nadu’s Legislative Assembly and Secretariat. The Fort Museum is a good place to learn about Chennai’s origins and the military memorabilia and artwork from colonial times are a must see here. Also stop by at the Rippon building, the office of the Chennai Corporation that is a beautiful white building commissioned in 1933. The 2.5 meter clock here called Westminster Chiming Clock is an attraction. The Government Museum here is the second oldest one in India and has an interesting display of archeological and numismatic collections spread over 16.25 acres, six buildings and 46 galleries. An offbeat place to see is the late 19th century Connemara Public Library where you can see publications that are centuries old. With a whopping 6 lakh plus books this is counted as one of Asia’s largest libraries. When you are here visit the Bronze Gallery and do try and watch a play here. If you like local shopping a visit to Ranganathan Street in T Nagar is recommended as the markets are abuzz with everything you could possible need. Silk sarees and gold jewellery are top picks but be prepared for crowds in the peak hours of the day. A visit to Guindy Park a national park in the middle of a city and is home to rich population of birds, animals and reptiles. Hop on to the electric vehicles here and you can see the whole place comfortably. Also try some local food at one of the numerous Murugan Idli Shops ideal for breakfast or the Sarvana Bhavan’s that dish out a full thaali for lunch and dinner. Known for its tradition of arts and culture, the city is a hotspot for the same and a visit to Kalakshetra that has a plethora of events including many dance performances is a good way to see it firsthand. The annual Margazhi Festival typically held in December-January is believed to be the largest cultural festival in the world with over 1000 dance and music performances and is held over 45 days. 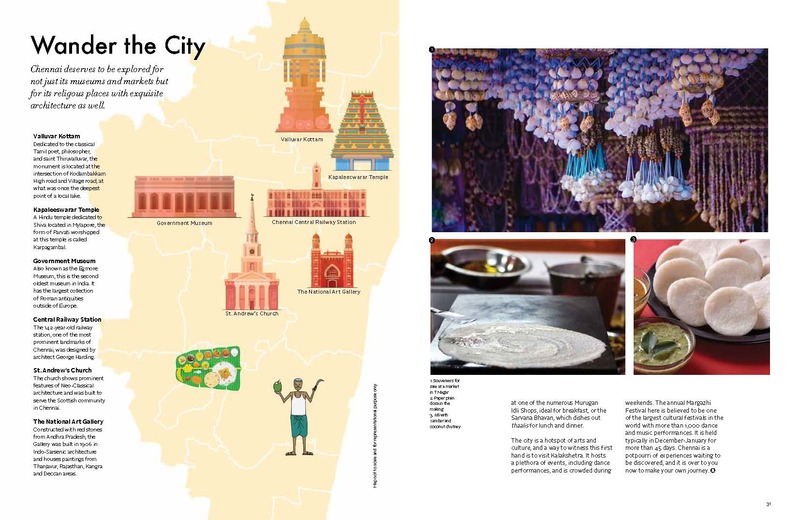 Chennai is a city that is a potpourri of experiences waiting to be discovered and it is over to you now to make it your own journey.